During the 1600s, Puritans in New England spotted more than just witches flying through the skies. Hundreds of years before Area 51 and Project Blue Book, Massachusetts Bay Colony founder John Winthrop detailed instances of unidentified flying objects in the heavens above seventeenth-century Boston in the first recorded UFO sightings in America. 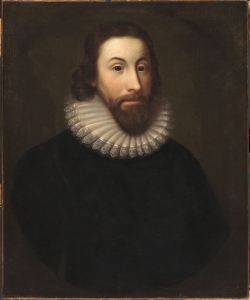 On March 1, 1639, John Winthrop opened his diary in which he recorded the trials and triumphs of his fellow Puritans as they made a new life in a new land. As the governor of the Massachusetts Bay Colony put pen to paper, he began to recount a most unusual event that had recently caused a stir among the English immigrants. Winthrop wrote that earlier in the year James Everell, “a sober, discreet man,” and two others had been rowing a boat in the Muddy River, which flowed through swampland and emptied into a tidal basin in the Charles River, when they saw a great light in the nighttime sky. “When it stood still, it flamed up, and was about three yards square,” the governor reported, “when it ran, it was contracted into the figure of a swine.” Over the course of two to three hours, the boatmen said that the mysterious light “ran as swift as an arrow” darting back and forth between them and the village of Charlestown, a distance of approximately two miles. “Diverse other credible persons saw the same light, after, about the same place,” Winthrop added. I was going to go with Puritan weather balloons myself. Sports Hernia wrote: I was going to go with Puritan weather balloons myself. Dang you I should have thought of that!! !